Banarasi Silk Sari / Saree is in vogue in India ever since the Mughal era. Check out this article to learn more about the Banarasi sarees. Woven out of fine silk and bearing elaborate golden embroidery either along the border or all over, the famous Varanasi sari made in the holy city of Banaras in Uttar Pradesh state since the ancient times is ranked among the finest traditional sarees of India. These saris are quite heavy due to its rich embroidery and are donned by Indian women only during special occasions like wedding, parties and festivities. Most ladies wear heavy gold jewellery to complement the Banarasi sari. The tradition of making Varanasi or Banarasi sarees in Varanasi or Banaras is very ancient. But it has continued to be passed down from one generation to another and continues to flourish. One will find thousands of weavers making the Varanasi silk saree in this scared city even today. The training usually begins when one is as young as 10 years. 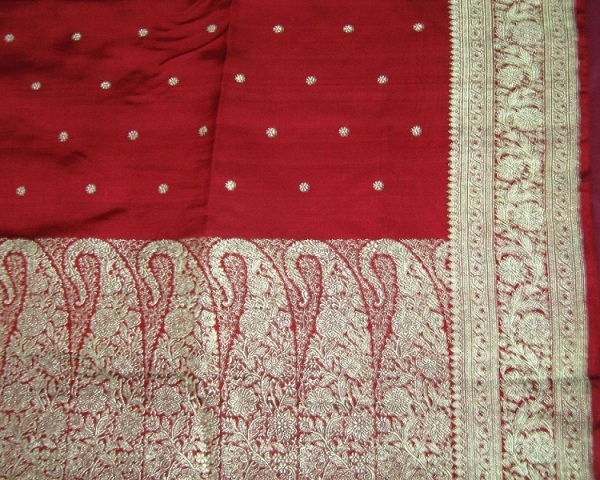 It is believed that the making of Varanasi saree gained prominence during the Mughal rule. Persian motifs were fudged with Indian designs on silk to create the distinct flowery patterns so typical of Varanasi saris today. Created in eye-catching shades and pattern, the Banarasi sarees of India are so famous today that they are exported all over the world. They usually fall into four categories – pure silk (katan), organza (kora) with zari and silk, georgette and shattir. Weaved on the power loom, normally three people are required to make one Varanasi sari. Each Banarasi silk sari can take 15 days to six months to complete depending upon the intricacy of the designs. Banarasi sari manufacturing supports strong cottage industry in areas like Varanasi, Gorakhpur and Azamgarh. Earlier the silk for Banarasi sari used to be imported from China, but nowadays they come from mainly from Bangalore in South India. Banarasi sarees earlier used to bear designs made out of original gold and silver threads and thus, used to cost several lakhs of rupees. They were worn by the people from royal families only. If the designs were too elaborate, manufacturers then even took a year’s time to make create a single saree. Since the use of simple threads came into prominence, even those Indians with average income came to afford Vanarasis. Though Varanasi or Banarasi sari is mainly made in the holy city of Banares in India’s Uttar Pradesh state, they are exported in bulk not only to different region within the country but also outside. When purchasing in India, the best option for buying the Banarasi sari is visiting state emporiums or shops selling traditional Indian sarees. If in Delhi, you can check out Karol Bagh market, CTC Plaza, Nalli Saris, Dilli Haat and other such places.